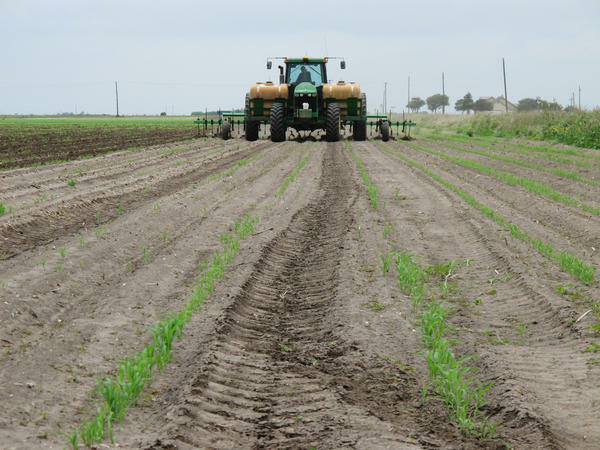 A field of recently-sprouted grain sorghum in Lyford, Texas, shown in a photograph from May 2013. In the latest salvo of a growing trade war, China announced a temporary 179 percent tariff on the U.S. crop. In the latest in a bitter trade dispute between the U.S. and China, Beijing on Tuesday said it would impose anti-dumping duties on imports of U.S. sorghum. China's Commerce Ministry says it will force U.S. sorghum exporters to pay a temporary 178.6 percent "deposit," which will act as a tariff on the cereal grain that is used in China as feed for cattle and as a sweetener in many products, including baijiu, a popular Chinese liquor. The ministry said in a statement that its preliminary decision comes after a two-month anti-dumping investigation found that shipments of sorghum have been unfairly subsidized, hurting Chinese farmers. China is the largest buyer of U.S. sorghum – grown mostly in the rural American South, a region that voted heavily for Trump in the 2016 election. China relies almost entirely on the United States for its sorghum, importing about $1 billion worth of the grain a year. The Commerce Ministry says the new charges, which take effect Wednesday, could be reversed by a final decision in the sorghum probe expected later. The ministry launched the investigation in February in what many observers said was meant as a retaliation for the Trump administration's tariffs on Chinese solar panels and washing machines late last year. It said the investigation had found Chinese imports of sorghum had increased 14-fold in the five years from 2013 even as the price for the commodity fell 31 percent. The Trump administration has recently threatened up to $150 billion worth of import duties on Chinese products ranging from steel to robotics, while China has responded with its own list of U.S. products that would be subject to higher tariffs – including soybeans, aircraft and automobiles. The Wall Street Journal notes, "U.S. sorghum exports to China peaked at $2 billion in 2015 and have averaged nearly a $1 billion a year over the past two years, according to official U.S. data. That makes it a sizeable export—though well below soybeans, more than $12 billion of which were sent to China last year."